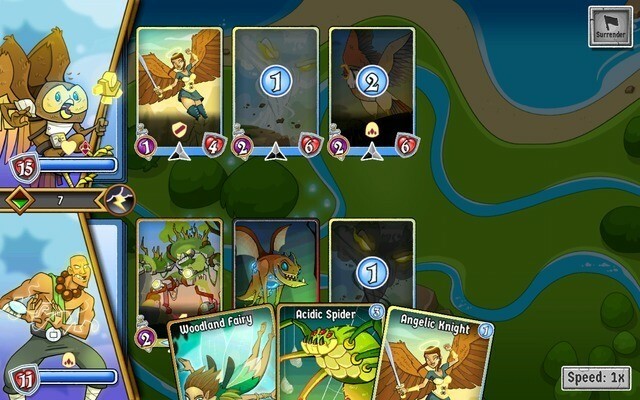 Spellstone is a simple, but beautiful collectible card game. Set in a fantasy world, the game lets you gather hundreds of creature cards and use them to battle villains. The more battles you win, the more “spellstones” you collect. With these enigmatic stones, you can summon powerful and rare creature cards to fight stronger enemies. For those who like fantasy card games, there’s another game called Card Monsters, which is as immersive and addicting as Spellstone. 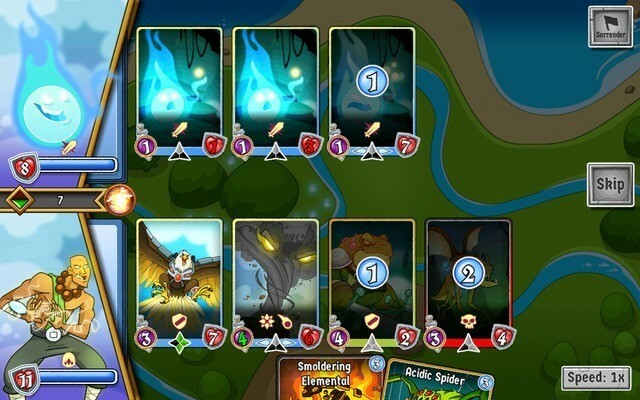 Read our Card Monsters guide to know more about this game. 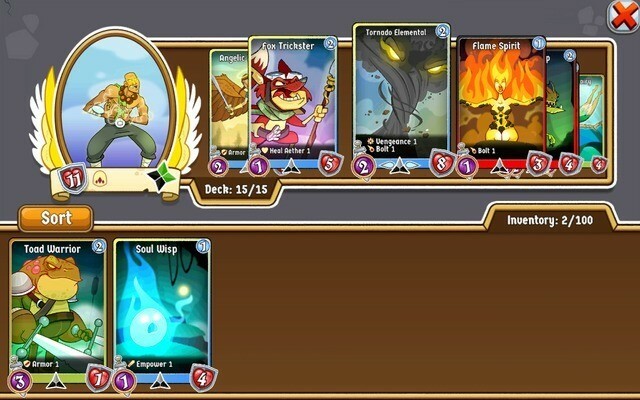 The game has an easy learning curve and a mini-tutorial explains all the ins and outs of card battles. Having a powerful 15-card deck, a strong card lineup and timely upgrades will help you win PvP and story missions. These quick tips and tricks may help you find the right creature combo, win more missions and earn rewards. The game draws three random cards from your 15-card deck. Of these three cards you will need to drag a card of your choice to the battlefield. The 3 random card system gives limited choices, so make sure you build a stronger deck first. Next, of the three cards selected by the AI, choose the one that has a special power/skill and a low number of turns, 1 or maximum 2 turns. Choose a card with low number of turns to get the first strike opportunity as soon as possible. Alternatively, you may draw a card that has max attack or health value. Keep an eye on all three cards’ attack and health values and choose the strongest of them. 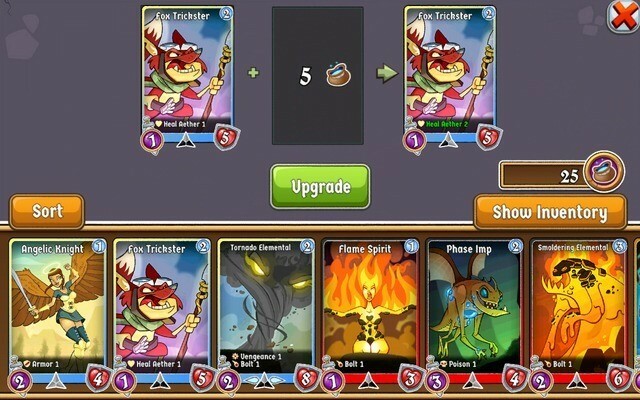 You may also select a card (example: Woodland Fairy) that attacks right away, but make sure you have an upgraded one with improved health values. However, choosing a strong creature card with an offensive or defensive special power will help you not to lose it faster. Don’t keep a duplicate card in your deck; try to fuse it with the original card (both cards need to be maxed out before fusing together). In case you don’t have enough arcane dust for leveling up the duplicate card, replace it with a spare one from your inventory. However, if you don’t find a proper replacement or the replacement is not as strong as the duplicate card, then keep the latter. 1. Must-have creature cards in your deck are Poison, Armor, Vengeance, Pierce and Empower. Have at least one or two card belonging to these skills. Some creature cards won’t have special attack or skills unless they have been leveled up first. Your first priority is to level up such cards first before doing anything else. Tap on cards > Upgrade and drag those cards that that don’t have any special attacks. Some creature cards’ special attacks can also be leveled up. Keep an eye on them. For example, leveling up Fox Trickster using arcane dust upgrades his skill “Heal Aether 1” to “Heal Aether 2”. In the beginning, the game allows you to recruit one hero from 3 heroes – Oda the Guardian, Aria the Necromancer and Elyse the Ranger. Choose your Hero wisely. Each hero has his/her own special ability. 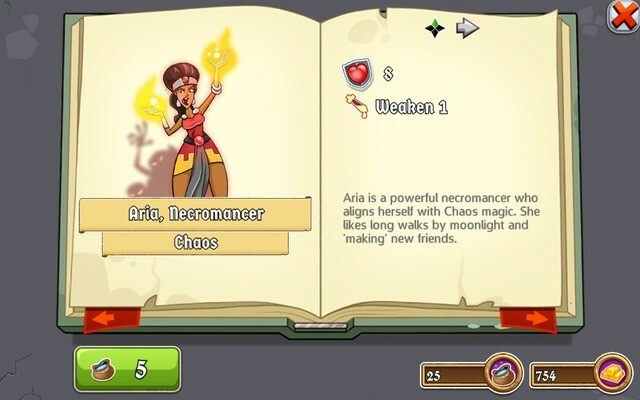 Aria the Necromancer can weaken enemy’s attack temporarily by snagging an attack value from a random card. Oda, Guardian reduces the damage dealt to a random creature by creating a Barrier. Elise the Ranger heals by adding a health value to a card with missing health. Of these, you may choose a hero that provides optimal benefit to your deck. Once you have recruited a hero, you cannot recruit the other two unless you have ranked up in Bounty missions. Once you reach rank 3, you will find more hero choices. Heroes can also be leveled up using arcane dust. Tap on the arrow on a hero’s profile book to see upgrade benefits. Tap on “Cards” > Edit Deck. On your deck, tap on a card to open a book. It provides complete information, including stats and skills. Noticed the star-like shapes below the creature’s name? These suggest whether your creature has been leveled-up or not. A fully filled up star means the card has reached the max level and is ready to be combined with a maxed-out duplicate card. When you level-up a card, part of the star fills up. You can see level-up benefits of a card by tapping on the light gray arrow button on the pages of the info book. You can evolve or upgrade a card after maxing out its level. Combine it with another max-level duplicate card and tap on Fuse. You will get a card with improved stats. Fusing cards gives a stats boost and may even add an extra special attack or skill to some cards. 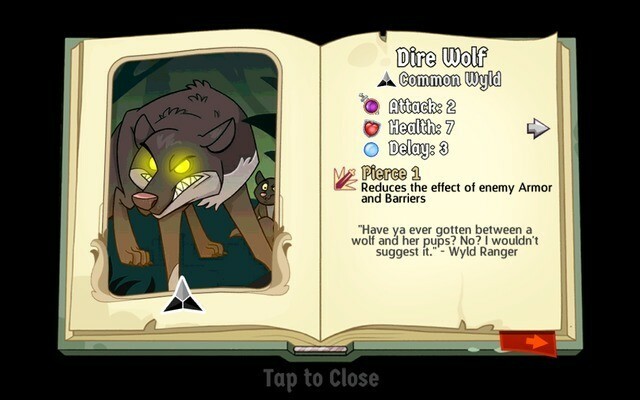 Look for upgrade benefits by tapping on a creature card and flipping the pages of info book. Fusing a card also changes creature’s name, so a Fox Trickster changes to “Fox Charmer” when you complete the dual fusion process and finally a powerful Fox Conjurer appears when you complete the quad fusion process (which requires 4 cards of the same type to complete the fusing process). To know fusion benefits, tap on the red bookmark at the bottom of the info book. Keep tapping to see what Fusion benefits a card has until you reach the end of the book. You will see information about the evolved card, including leveled-up skills. Having stronger cards in your battle deck can make it harder for enemies to defeat your creatures. Drag a card to a battlefield that has special skill or high attack or defense values than the other 2. Also, make sure the card has lower number of turns. In every turn, keep adding those cards that are better than the other two cards (delay-wise and stats-wise or skill-wise) chosen randomly by the game from your 15-card deck. Before launching your creature, tap on the enemy card to know more its skills and stats. Draw a card based on the enemy’s line-up and make sure you don’t choose a weaker card stats-wise. So if an enemy chooses a card with a pierce special attack, try to delay choosing an armor card as pierce ignores armor cards and can inflict damage. In case the enemy chooses armor card, your goal is to weaken its attack using pierce or use a poison card to drain its health. Bounty missions are PvP card battles that not only let you earn gold but also increase your bounty rank. Once you reach a particular bounty rank, you will unlock more heroes, each with increased health and devastating special skills. The unlocked heroes can be purchased with gold. Keep playing bounty missions to rank up and earn gold. You also keep playing story missions, new and previously-played ones, to earn more gold and other rewards. Of three cards randomly chosen by the game, choose the armor as your first card if you spot one. Drag it to the battlefield. You may then drag cards like vengeance, poison, empower or pierce. The armor resists most attacks. In Spellstone, having armor as the first card can make it difficult for the enemy to destroy your first line of defense. It will also boost your confidence you can then keep stronger cards beside it as they take out enemy cards one by one. Make sure the cards you drag have lower number of turns.